Improving the efficiency of power supply is a critical issue in view of the demand for energy conservation in these times. Concomitant with this requirement, the amount of power consumed when a device is in a standby status is also an important improvement goal, and various measures have been taken to meet this need. Whereas the efficiency of a switching DC/DC converter can reach almost 95%; in the case of an AC/DC converter, the conversion efficiency on the primary side actually leaves some room for improvement. Also, as the power to be handled increases, a power factor correction (PFC) is needed, requiring additional circuits and expertise on the part of the design engineer. In AC/DC conversion, the adoption of a switching system is essential to improve efficiency. Such an approach, as discussed previously, requires high voltage parts such as diodes and capacitors capable of directly rectifying and smoothing out the 100VAC, as well as transistors capable of subsequently switching a DC voltage close to 140V, all of which increases costs, as would be expected. 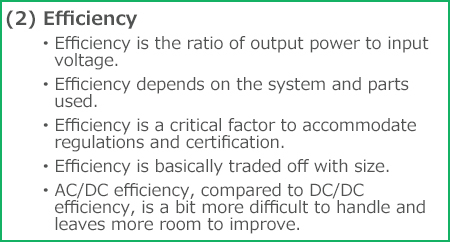 This is an important factor as a tradeoff in relation to requirements for power conservation. ・If efficiency is the primary concern, the switching system should be selected. ・The size and efficiency of a converter represent a tradeoff relationship.